Human Digestive System1 -here is an excellent photo detailing how the digestive system works. Click ON PHOTO or here to go back to how food is digested. 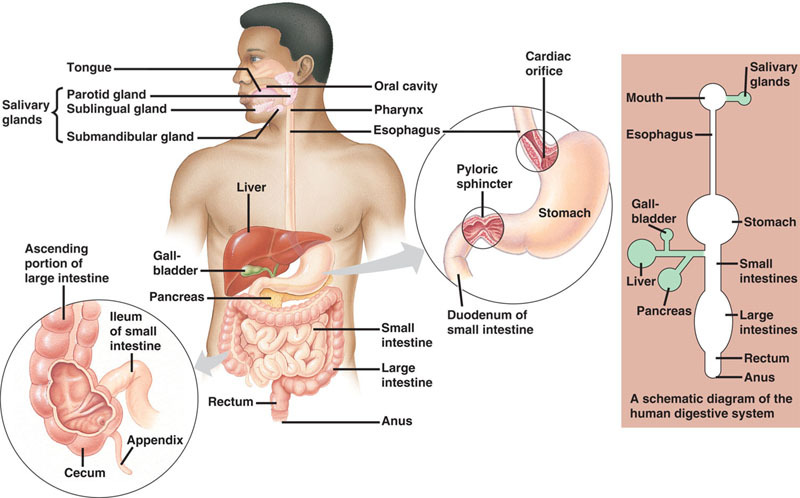 The human digestive system1 is a complicated and impressive system. Understanding how the digestive system works helps us to eat healthier. Stay healthy by what you eat and keep your digestive system healthy. When you eat food, the saliva mixes with the food. This is a very important process in preparing the food for the stomach. The salivary juices and enzymes help break down the food beginning the process of changing the food to the parts the body can utilize such as carbohydrates (disaccharides maltose, etc), proteins, fats, vitamins, minerals, etc. When you take smaller bites and chew the food well before you swallow it, you help make the job of the stomach a little less difficult. The stomach is an amazing place where acids and enzymes work hard to kill bacteria, start the process of breaking food down into small molecules -nutrients the body can actually process such as carbohydrates, fats, proteins, vitamins, etc. The stomachs digestive juices include saliva, mucous, hydrochloric acid (HCl), enzymes, bicarbonate and bile. What ends up leaving the stomach and heads to the small bowel is chyme which is semi-digested food. The body absorbs the molecules and nutrients that have been broken down, when it goes through the ileum (~5-7 feet long), which is the last section of the small intestine before it links to the large intestine. The villi lining the wall of the ileum help give a large surface for absorption. Nutrients are absorbed through various ways including active transport, endocytosis, facilitative diffusion and passive diffusion. Fatty acids, fat-soluble substances, monoglycerides and cholesterol are absorbed through simple diffusion. Amino acids are absorbed through active absorption. Sugars like fructose are absorbed with the help of carrier protein molecules. Water and water-soluble substances are absorbed through osmosis. Water soluble nutrients leave the GI tract in the blood and travel through the portal vein to the liver and then to the heart. The nutrients that come from the food we eat and get broken down are absorbed into our body and then transported by the blood system and the lymph system to all the cells and organs in our body. The cells use these nutrients on the molecular level to give us the energy we need, the ability to heal, the fuel for our cells to do what they are supposed to do: like your heart beating! When you smell food or think of food, this triggers the hormones and nervous system that coordinates digestion and absorption (like the brains behind it). If you are stressed or sick this can slow the process of digestion down. At the end of the digestion process, the waste products leave the small intestines with the help of fiber and enter the colon the large intestine. The colon reabsorbs water and the friendly bacteria helps process vitamins and nutrients. Any fiber or undigested food that does not get broken down is excreted in the stool. That is how the digestive system works in a nutshell! Read about Flaxseed + how Human Digestive System1 can Give Nutrition Your Body Craves! Want to know more of the incredible Flax Benefits? Leave this digestive system, how the digestive system works page to go to Home page.